Tourism Pressure; Lack of capacity in conservation techniques;Lack of management mechanism (including legislation); Lack of institution coordination; Fire. In accordance with Decision 27 COM 7B.45 adopted by the 27th Session of the World Heritage Committee in 2003, the State Party submitted a progress report on 12 January 2004. Maintenance and protection of the Potala Palace and the conservation of Norbulingka began in June 2002 and are continuing as planned. A fire prevention plan and a security system for Jokhang Temple are due to be completed in 2004. Measures are in place prohibiting the destruction of ancient buildings in the Shöl area, which will maintain its key function of demonstratives of traditional Tibetan cultural society. The current conservation plan has not yet been made available to the public with periodic review mechanism in place. The recommended establishment of an agency for the management and development of Old Lhasa and the World Heritage property has not yet been carried out. The Government of Tibet Autonomous Region (TAR) plans to list cultural heritage sites in Old Lhasa for protection at the autonomous regional level. Currently there are six cultural heritage sites protected at State level, six at the autonomous regional level, six at city level and a further 93 ancient buildings listed for protection. Public participation has been encouraged in cultural heritage protection activities and programmes are being formulated by the Tibet Administration for Cultural Heritage to increase awareness and to subsequently further public involvement in heritage conservation. Training activities on the development of tourism and guidance on sustainable tourism development have been planned. It was recommended that a study tour relating to the management of World Heritage properties and exchange programmes between site managers be organized, which is encouraged by the Chinese Government. On reviewing the progress report, ICOMOS stated that its content is unclear regarding the progress made since the decision of the World Heritage Committee at its 27th session. The report does not mention the situation or state of conservation in the Shöl Area now that the local residents have been evacuated, nor does it comment on the recent rapid modernisation outside the buffer zone. A press report has been received by the Secretariat expressing extreme concern about the current restoration work, taking place at the Potala Palace, Lhasa. It notes that no workers, specifically no Tibetans, with knowledge of traditional skills and restoration techniques have been employed to supervise and work on the restoration of the floors, walls and roofs of the Palace buildings and that this has led to cement and other inappropriate materials and methods being used. The report goes on to say that the use of these reportedly inappropriate restoration techniques will cause serious problems leading to the eventual disintegration of the fabric of the buildings and thus the loss of authenticity of this World Heritage property. a) Institutional requirements: The conservation challenges and potentials in Lhasa would benefit from a management and development agency to coordinate activities in Old Lhasa, which could be responsible for the management of Old Lhasa and the World Heritage properties. It is recommended that such an agency be established to raise and administer funds from national and international donors. b) Conservation, planning and urban development: Taking into consideration the on-going processes of change and urban development, it is recommended that a review of the urban development plan is undertaken to ensure integrated territorial urban conservation challenges of Lhasa. The conservation plan of 1995-2015 should be made available to the public to increase their appreciation of the plan. A mechanism to periodically review the relevance of the conservation plan should be built in the planning process itself. c) Protection: In view of the rapid change in the character of Old Lhasa, all remaining historic traditional buildings in Lhasa should be protected at the level of the Autonomous Region or at the national level. d) Conservation and rehabilitation of historic traditional buildings: Except in exceptional circumstances, demolition should be stopped, particularly in the Shöl area. Any necessary replacement buildings should be in keeping with the historic character of the area. The State Party is requested to inform the World Heritage Committee of its policy on the conservation of the historic urban fabric of Lhasa. e) Conservation awareness: It is recommended that the management authorities set up a programme to encourage community participation and increase awareness of heritage conservation needs amongst the local residents. 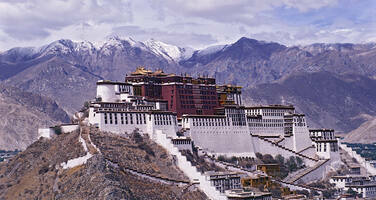 f) Protective areas and buffer zones: It is recommended that the management authorities evaluate and redefine the current World Heritage protective boundaries and management guidelines pertaining to the Potala Palace, Jokhang Temple (including the Barkor Historic Area) and Nobulingka, taking into consideration the heritage values of the surrounding landscape and environment. g) Tourism: In view of the potential in-come generation opportunities from the tourism industry for financing conservation work in Lhasa, the heritage management authorities are encouraged to develop training activities and provide guidance on sustainable tourism planning at the World Heritage properties in Lhasa. h) International outreach: An exchange programme between the World Heritage site managers in Lhasa and the managers of World Heritage properties in other countries is encouraged to develop on-site and international co-operation activities. The Chinese authorities may consider the organization of a study tour to successfully managed World Heritage properties focusing on the selected issues identified above. 9. Further requests the World Heritage Centre and ICOMOS to undertake a mission to the property as soon as possible, and to present a report on the progress achieved in the implementation of the above recommendations, for examination by the Committee at its 29th session in 2005. 10. Further requests the State Party to take appropriate action to follow up on the findings and recommendations of the UNESCO-ICOMOS reactive monitoring missions in a concerted manner and to submit, by 1 February 2005, a report on the progress achieved in the implementation of the above recommendations for the consideration of the Committee at its 29th session in 2005.